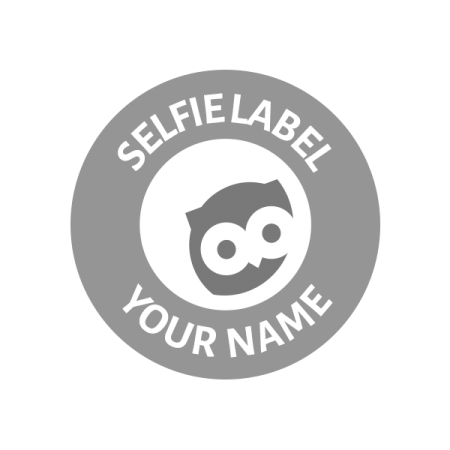 Our selfie rectangle labels are perfect for long names, adding phone numbers and getting noticed. They come in 2 sizes, large and small. The large rectangles are ideal for bigger items like drinking bottles, and valuables like bicycles and laptops. The small rectangles are ideal for tight spaces such as clothing ‘care’ tags in uniforms. As self-adhesive labels there is no ironing or sewing, plus they are waterproof, UV and dishwasher safe. It’s quick, they stick, and we guarantee you’ll love them. Click on the camera icon for your upload window to appear. You can also click on the blue bar above the label: (i) ‘Edit Stuff’ lets you upload your image and change colours and words. For more instructions and troubleshooting see the tab below (scroll down!). Click the camera icon to upload a custom image from your computer. To edit the text or colours click on the label or use the ‘Change layers’ & ‘Change icon’ options in the blue bar. Items you can edit are the text size and shape, text colour and uploaded image size and rotation. Once you’ve finished, don’t forget to choose your label size and pack size.